Home→Book Launch→CRIME PLUS MUSIC Shelf Awareness Book Giveaway: Enter to Win! CRIME PLUS MUSIC Shelf Awareness Book Giveaway: Enter to Win! Modern life seems to have a soundtrack for everything. Even crime. CRIME PLUS MUSIC: Twenty Stories of Music-Themed Noir collects twenty darkly intense, music-related noir stories by world-renowned mystery authors Craig Johnson, Brendan DuBois, Val McDermid, Gary Phillips, Peter Robinson, Mark Haskell Smith, Bill Fitzhugh, Naomi Rand, Zoë Sharp, Reed Farrel Coleman, Peter Blauner, David Liss, Alison Gaylin, David Corbett, Tyler Dilts, A. J. Hartley, Erica Wright, and, from the music world, Galadrielle Allman, author of Please Be With Me: A Song for My Father, Duane Allman and award-winning songwriter-novelist Willy Vlautin. Edited, and with a contribution by novelist and Wall Street Journal rock and pop music critic Jim Fusilli. The lively anthology’s chilling, sinister tales tap into the span of rock and pop history, ranging from Peter Blauner’s heart-wrenching “The Last Temptation of Frankie Lymon” to Fusilli’s “Boy Wonder,” set in the world of contemporary electronic dance music; from Naomi Rand’s “The Misfits,” a punk-rock revenge saga to Mark Haskell Smith’s menacingly comedic “1968 Pelham Blue SG Jr.”; from Reed Farrel Coleman’s study of a one-hit wonder, “Look at Me/Don’t Look at Me” to Erica Wright’s account of betrayal among minor talents in “A Place You’re Likely to Find”—and many more. 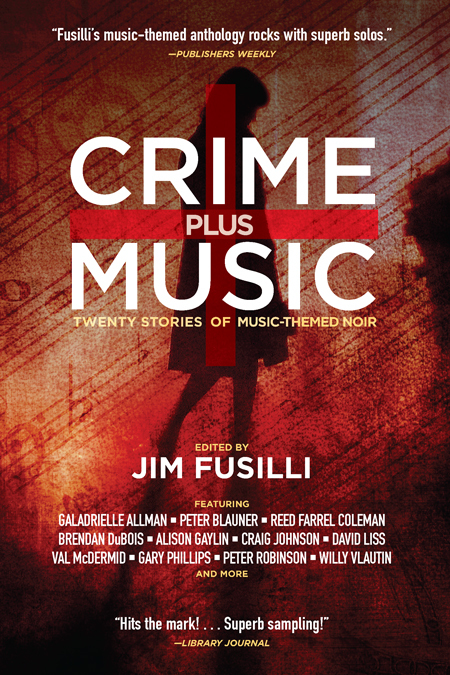 In the hands of these modern masters of mystery fiction, CRIME PLUS MUSIC exposes the nasty side of the world of popular music, revealing it to be the perfect setting for noir. Open to residents of the fifty United States and the District of Columbia, age 14 or older. Sweepstakes begins October 2, 2016. Entries must be received no later than October 9, 2016 11:59:59 PM Eastern Time. Winners will be selected on or about October 10, 201. LIMIT ONE ENTRY PER PERSON. Anyone entering more than once will be disqualified.